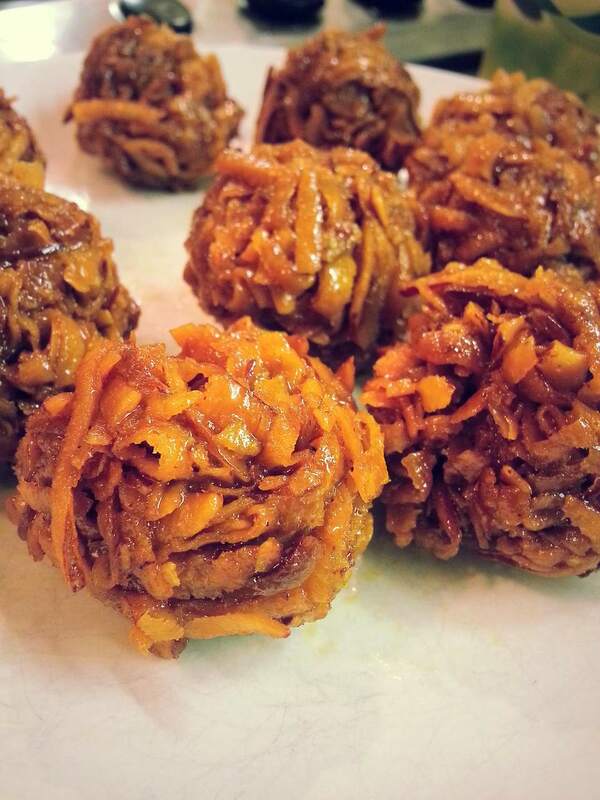 I have fond memories from when I was little of eating candied coconut balls that my mom would make. I remember watching her and I know that other than making the caramel, she would add a hint of lemon juice to the mixture and finally, meticulously sliced or grated fresh coconut to the caramel. Mom had, and still has, asbestos hands so she would shape the coconut candy into balls with her bare hands after the mixture had cooled slightly. I would not recommend this. However, if using tools such as spoons or an ice cream scoop for shaping, the compromise is to end up with loose coconut ovals and some extremely sticky kitchen utensils! I would recommend buying pre-shelled coconut pieces as opposed to buying a whole coconut from scratch because cracking that big nut can prove to be quite a daunting task. If making the coconut balls comes across as a bit too much effort, try the roasted peanut version, known as nkate cake. However, if you do have the patience, I highly recommend Candied Coconut Balls as a suitable sweet treat that goes well with a cup of tea. Crack that nut in any way you can. I resorted to dropping mine on a stone floor, however, the coconut water spills out that way. The alternative is to hit it with a hammer to form a crack, pour the water out into a cup, and then proceed to crack with a hammer. Of course, if you buy pre-shelled coconut pieces, you can skip the pleasantries (trauma) of shelling a coconut and proceed straight to the recipe. Grate the coconut using the large teeth of your grater, although the size does not entirely matter. Make the caramel by dissolving the sugar in the water and lemon juice. Stir until most of it is dissolved on a low heat prior to bringing it to a boil. Allow to boil to 5 to 10 minutes without stirring. This prevents granules from forming and allows the sugar syrup to form a lovely brown caramel. Once the caramel is a slightly deep shade of brown (not burned! ), add the shredded coconut and stir for 10 minutes. You will find that the coconut oils and natural moisture will be released. Continue to stir until the caramel coconut gives off a wonderful coconut aroma. Grease a plate with butter or margarine and place the shaped balls of coconut. Allow to cool down until warm prior to serving. If you have enough time to allow them to cool completely, microwaving each ball to warm it and soften it makes it much easier to enjoy.